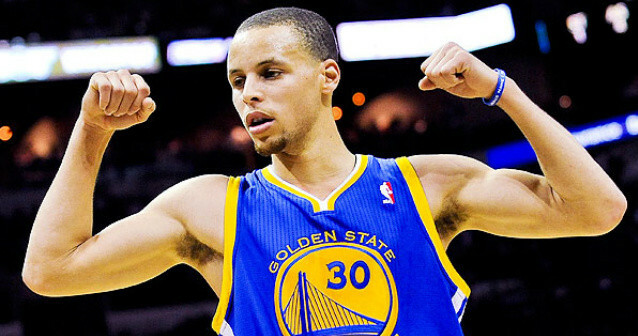 Last week, the All NBA teams came out led by league MVP Stephen Curry on the first team. Joining Curry on the first-team were New Orleans Pelican’s power forward Anthony Davis, Memphis Grizzlies’ center Marc Gasol, Cleveland Cavaliers’ small forward LeBron James, and Houston Rockets’ shooting guard James Harden. With their teams up 3-0 in their conference finals, Curry and James will most likely meet in the NBA finals which is certain to receive high television ratings. If the Warriors do indeed make it to the NBA finals against the Cavaliers, Curry will have the rare opportunity to defeat his fellow All NBA first-teamers throughout this year’s playoffs. The Warriors started the playoffs sweeping Davis and the Pelicans 4 games to 0. After taking game one against the Grizzlies, the Warriors lost two in a row to Gasol and his teammates before closing out the series with three straight wins. As stated earlier, the Warriors are up three games to zero against Harden’s Rockets. Curry has demonstrated why he was voted league MVP over Harden in this series. Even the Houston fans have to agree Curry is the one who keeps the Warriors going after he dropped 40 points in game 3 and made a number of heads up plays that show his high basketball IQ. Curry is averaging 35 points in the series and shooting an incredible 61% from the field. Did I mention he also broke Reggie Miller’s record of 58 three-pointers throughout the playoffs. Miller did it in 22 games while Curry broke the record in 13 games. Look for Curry’s story to be a big part of the NBA finals if it is the Warriors against the Cavaliers. Would you like to see Curry and the Warriors defeat the Cavaliers so Curry would have defeated his All NBA first-team counterparts? « Do You Agree Jordan Clarkson’s Game is Similar to Russell Westbrook?